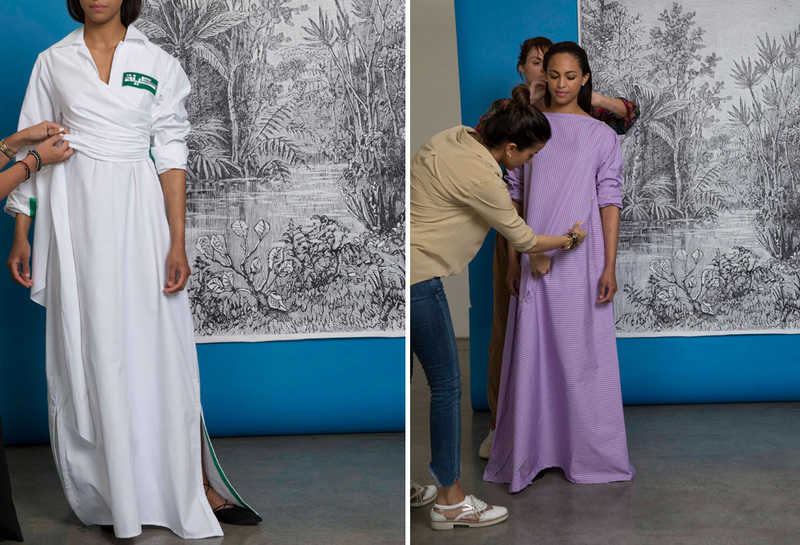 For our Resort Ramadan 2018 look book we worked with Dubai-based The AgenC and their talented team, which included photographer Mariah Jelenak. Creating a Ramadan collection is an opportunity for me to present unique kaftans that can be worn during the holy month, as well as offer clothes that are versatile enough to carry through into the Resort season. I also wanted to covey a feeling of serenity and calm, especially since Ramadan is about embracing spirituality. The collection features soft cotton kaftans sporting straps and buttons as both closures and embellishments, while my color pallet was inspired by those of the Chakra. They include soft whites, pale mauves, lilacs, greens and rose; colors which are meant to invoke light and the divine. Rounding out the spiritual theme are custom embroidered patches sporting the Arabic words for light, mantra, love, meditation, calm, peace, silence and spirituality.